One of my favorite times of the year fall eating these baked apple cider donuts. These are all dressed up for the Halloween Holiday, just one of many delicious fall recipe treats. They even have bits of apples in them and smell fabulous while baking. Scroll down to see some other delicious donut recipes and check out my video. I love this alternative to making donuts baked instead of fried. They are a healthier version, but also so much easier to make. No greasy fried mess with all the added calories! Clean up is a breeze! These delicious apple cider donuts are perfect start to kick off the fall season. One thing that is a must have, the baking donut pan. You can find a donut pan at any bake shop or online. 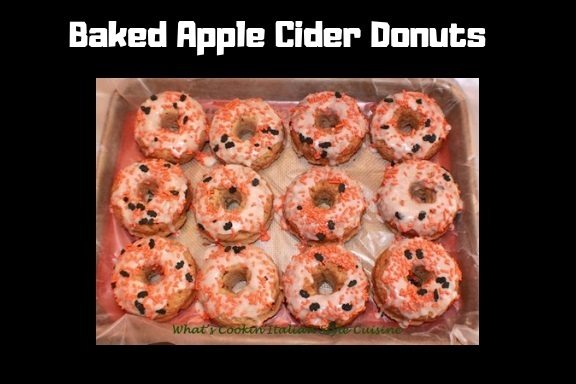 Be sure to buy baking apples and cut them in small pieces, these donuts cook quickly. I love my baked donuts glazed and this creamy delicious apple cider frosting I make for them. They are also delicious just plain and no frosting. 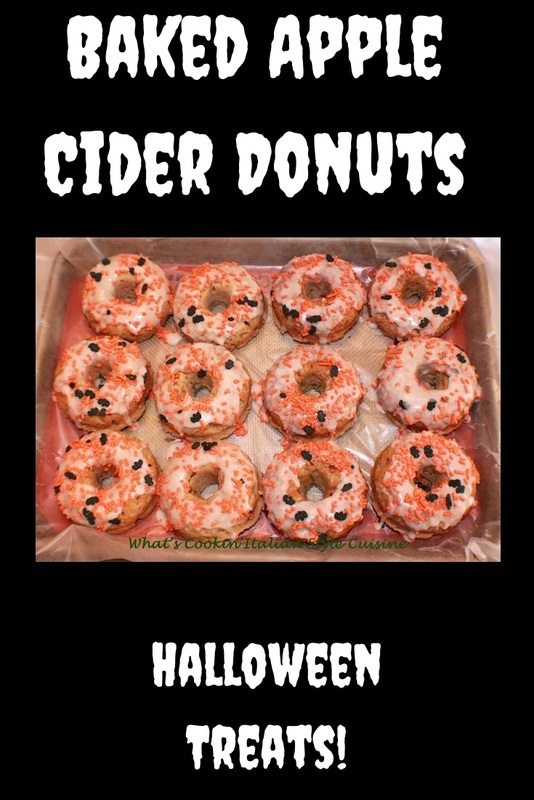 Baked apple cider donuts are the perfect treat all year long but dressed up for Halloween, a fun treat for everyone. The glaze is made with powdered sugar butter and apple cider, a delicious addition to these are some colorful Holiday sprinkles. The bits of apples in these delicious baked donuts keep them moist. I love the smell of these donuts baking, the smell of fall lingers in the house long after they are cooling. Cinnamon and spices make them shout fall. If you haven't made baked donuts before, you will love the ease of this recipe. The donuts rise nicely in the oven and pop out of the donut pan easily. Then after the cool, you can just drizzle a little frosting on top and decorate them. Really a simple recipe and fun to make for Halloween with kids or just because they are so darn good. 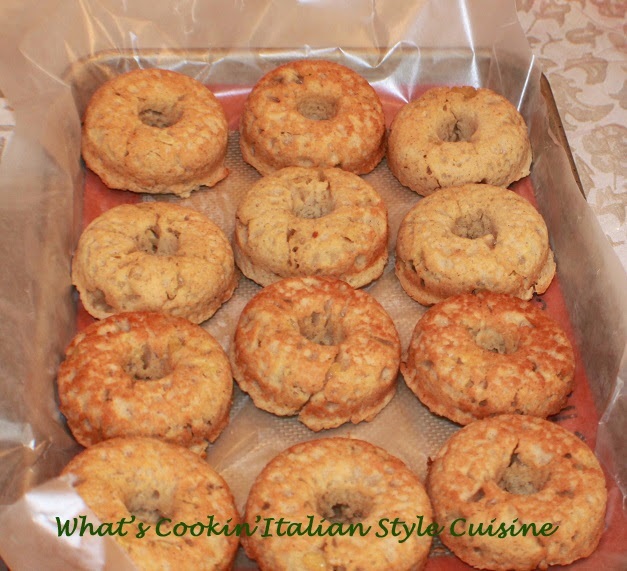 I have made several donut recipes and left you some links below to my other favorite recipes you can check out. If you are having a party check out my Halloween video for more Halloween Party ideas. 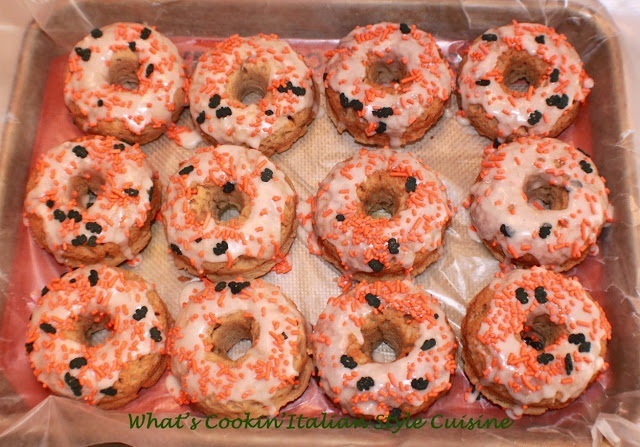 These are a delicious Apple Cider Donuts baked and dressed up for a Halloween Treat. In a heavy duty electric mixer bowl, add the oil or butter and sugar. Beat around 3 minutes. Add the egg, cider. Stir in the flour, baking powder, baking soda, salt and all the spices adding by folding in the finely diced apple last. Spoon into prepared sprayed and greased doughnut pans. Bake at 350 until browned around 25 minutes or until lightly browned. Makes 12 full size baked donuts. Mix together until free flowing. Drizzle over cooled doughnuts, sprinkle with colored candies. Great served with warmed apple cider and a cinnamon stick! Decorate them in orange frosting for Halloween parties too! Claudia these sound so tasty. I can't remember the last time I had a donut let alone an apple cider donut. Nice recipe! I love, love those little chunks of apple! What amazing doughnuts! How fun! These are really cute. These sound like apple pancakes, with the nice chunks in them! I have to get one of the doughnut pans! What fun! They look as crisy as if they were fried! These are so cute and festive!! I can taste them from here... *mouth watering* What a creative combo too!! These apple cider donuts look so delicious!! I love the frosting and can just imagine how wonderfully it complements the taste of the donut! 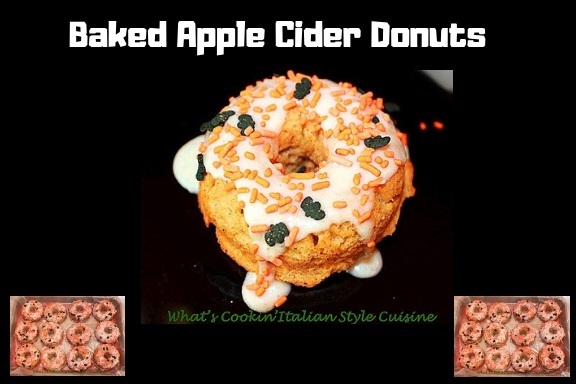 What an interesting flavors combined for this donut recipe! It surely sounds delicious! I've been wanting to get a donut pan for the longest time -- I've been postponing until we get situated in our kitchen. 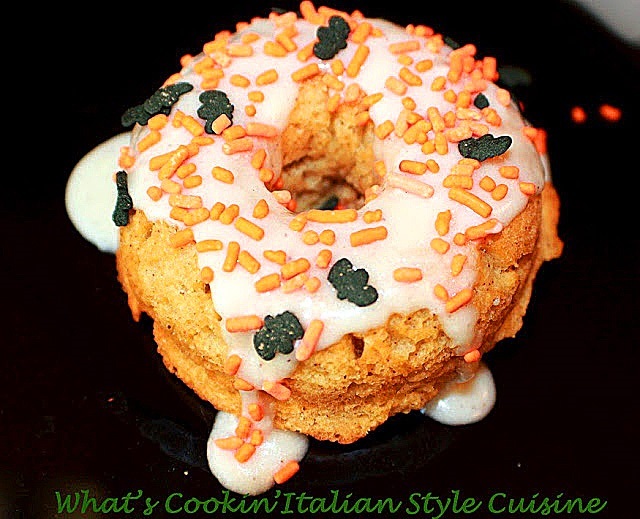 The donuts flavor is perfect for Fall and especially Halloween! They certainly would be popular for a Fall party. I love baked donuts.. These are such an addiction. That glaze looks so good. Interesting flavor with apple cider - sounds good. I love freshly made donuts, their taste, texture and smell are terrific. 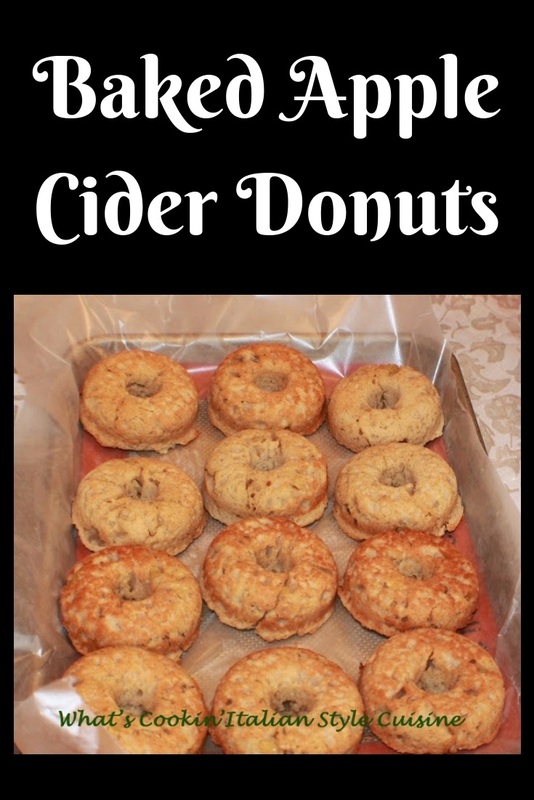 Apple cider is a favorite fall beverage and I always look forward to cider donuts. Cloudy apple cider doughnuts looks so good. They are absolutely perfect for Halloween. Love the frosting, simple yet so delicious and apt for halloween theme. What a great way to kick off apple season! These look like they both taste and smell really good! These beautiful Apple Cider Donuts have my taste buds wiggling! I want to reach through my screen and snag one. Yum!